Rangers chief executive Graham Wallace is on a salary of £315,000 a year with a 100% bonus, BBC Scotland has learned. Wallace has come under pressure to reveal his salary structure in recent weeks but declined to answer questions on the matter last Friday. However, shareholders have since requested sight of board contracts. Wallace is also due an increase of £25,000 per year as Rangers move up the leagues, plus additional bonuses for European qualification. A Rangers spokesman said pay and bonuses were in line with the requirements of AIM, the London Stock Exchange's international market for smaller growing companies. "Employing key executives of the appropriate calibre are vital to the board's strategy to both reposition Rangers at the top of Scottish football and to compete regularly in Europe," he said. "We are delighted to have a board made of up of such experienced professionals. All pay and bonuses are structured to meet AIM requirements and institutional investor guidelines (ABI and NAPF). "Bonuses are decided by a remuneration committee chaired by director James Easdale, who this year waived his entitlement to receive fees and repaid to the company £12,640.34 in fees he received in the last half of 2013 when was appointed a director. Mr Sandy Easdale has never received any fees. "The remuneration committee is responsible for setting and reviewing executive remuneration within the context of the company's overall corporate performance. "The remuneration committee reviews base salary with reference to a relevant market-competitive level and actual total rewards at a level to reflect the performance of an individual and the company as a whole." The Union of Fans, an umbrella body of supporters groups, had asked Wallace to publicly declare whether he was on a 100% bonus. 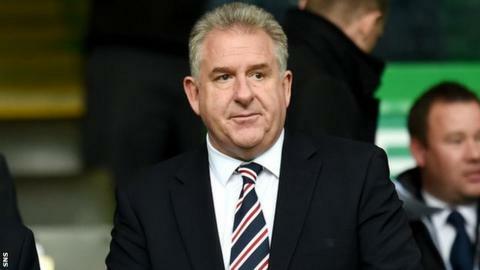 On hearing the news confirmed, Craig Houston, of the Sons of Struth - part of the UoF body - told BBC Scotland: "The circa £300,000 basic wage in itself is not unexpected nor maybe excessive for the position he occupies. "However, the amount of bonus does appear high, especially at a time that the board has announced possible redundancies and recently asked the playing staff to take a substantial wage cut. "I am sure that, unless Mr Wallace requires a £600,000+ salary to remain in such a privileged position, which many would consider an honour, I would fully expect that he would not have achieved the pre-set targets to attract this bonus and would find it sensible to publicly decline this bonus for this financial year."